Every day that I’m in Sicily is like Christmas, but some days do stand out from others. 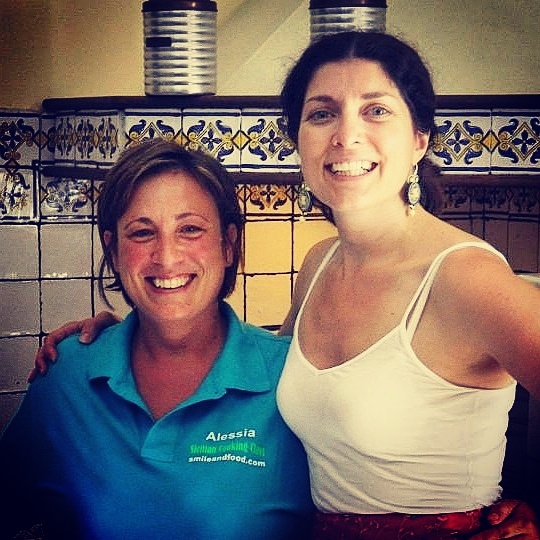 The day earlier this month that my husband and I spent with Alessia of Smile and Food Sicilian Cooking Class was particularly memorable. Alessia and her son Manfredi met us at the Mercato Antico on Ortigia island. She introduced us to the fish mongers, who we noticed had a guitar… Well, after singing a few Sicilian folk songs with Marco and his boss (who had a tambourine under the cash register! ), we tasted freshly made mozzarella and ricotta, different pestos, some bottarga, and caponata made with peppers versus eggplant. Then we made our way to her apartment where we enjoyed lunch together with her husband Damiano, a food and travel writer, and their two sons. Alessia is a fabulous hostess–and cook! Joe and I had a marvelous time talking with her and her family over a long, delicious lunch and a bottle of wine. It’s a day that I’ll never forget! Well… For part of the year, I’d like to!